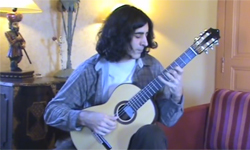 Oscar Caceres I, Oscar Caceres declares to have had as a student Olivier Mesnier in the Music Conservatory of Saint-Denis in Paris. This allowed me to follow his work for several years, thereby allowing me to certify its artistic qualities and its excellent musical training. In the educational field, I have in his respect, my highest consideration both artistically and for his personal and intellectual value. Gerard Montaudouin I hereby Mr Gerard Montaudouin in my capacity of guitar teacher for 42 years recommend my friend Olivier Mesnier. I have known Olivier for many years and had the opportunity to play duets with him. His artistic and pedagogical skills makes of him an excellent musician and instrumentalist (electric and classical). 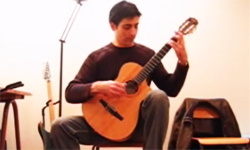 In recognition of my deep friendship I wrote and dedicated to Olivier a suite for guitar entitled “De Châtel à Compostelle”.